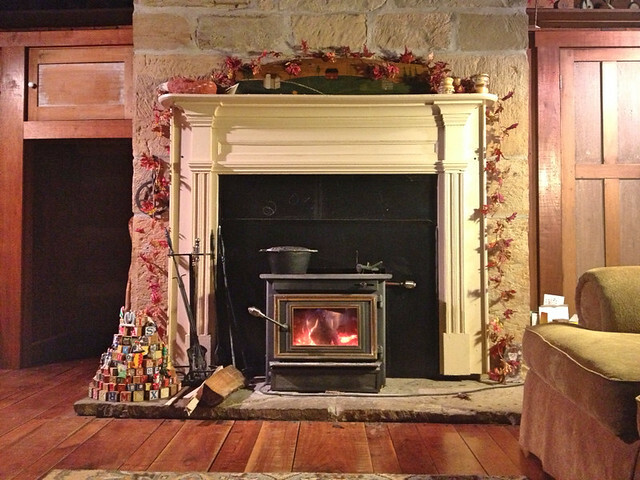 It is Thanksgiving day and there is a light covering of snow on the ground, time to stoke the fireplace and wood stove. Last year, about this time, I was in full panic mode! We had moved back to the farm just a few short months earlier and had a lot going on, getting into our new routines and just trying to fit into our new “homesteader” lifestyle. One of those routines that had totally slipped my mind was cutting firewood. So, when my wife, Deanna, had said she wanted to start a fire one chilly evening, I had a complete Homer Simpson moment …… D’oh! …..
Now I was in complete scramble mode. I couldn’t just go out back and chop down a few trees, the wood wouldn’t be seasoned (dried) properly, and I was NOT about to buy firewood when I live on a farm with access to tons of firewood. Then, my father had mentioned that there were slabs left over from when the portable saw mill was here a couple of years ago. Whew, I was safe! These slabs are the first cut that the mill makes on a log, which is usually discarded, and they have been drying for a couple of years. So, I headed off to the old mill site with the chainsaw and a can of fuel, a few hours later I was stacking a truckload of firewood on the porch and feeling pretty good about myself. That didn’t last long. Did I forget to mention that Deanna is from Florida and loves the heat from the wood stove. It was about a month later that I was back at the old mill site, digging through the snow, to scrape up the last of the slabs. I also found a few logs that weren’t cut into lumber, so I cut them into firewood as well. This time, I think I hauled 2 truckloads, and again I was feeling pretty good. About the middle of January or February we were out of wood AGAIN! I was so frustrated with the whole ordeal I broke down and bought a cord of wood from a neighbor for $225! That was a hard lesson for me to learn. As soon as the snow was gone and the ground was no longer frozen, I started cutting, splitting, and stacking firewood for this season. 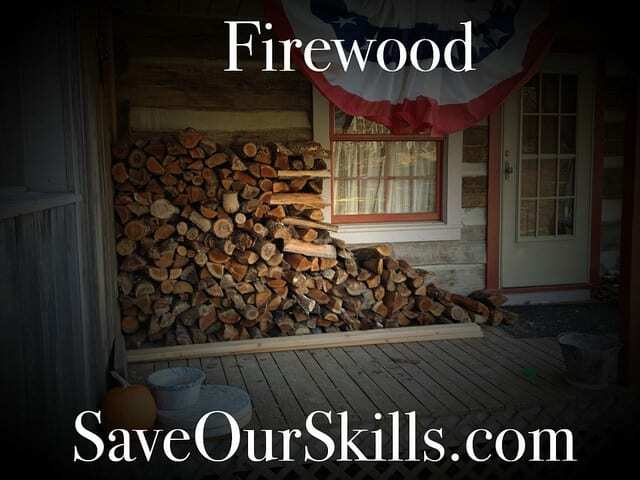 My son and I have worked hard all year to ensure that history does not repeat itself, I believe we have 8-10 cords of wood stacked neatly near the house. We have also been diligently saving the scraps from the wood shop to use as kindling. We do not heat our home with wood, however we have 2 open fireplaces and 1 wood burning stove, so we could do a pretty good job at heating the house if we needed to do so. I have considered an outdoor wood burning furnace/boiler, but having to go outside to stoke the fire is my biggest complaint. One of our neighbors has an indoor wood burning furnace, but I really don’t know much about them. So, how do we process firewood? 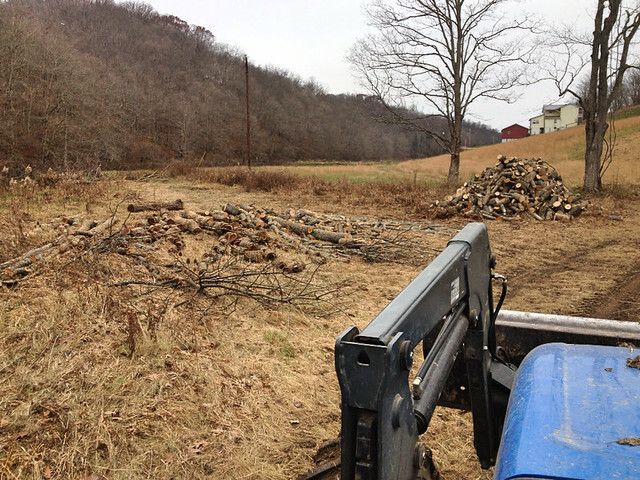 This year, we cleaned up an old pasture that had been reverting back to forest. It had quite a few cherry and ash trees that we used for firewood. Once the tree has been felled we limb the tree, cutting all branches from the main trunk. 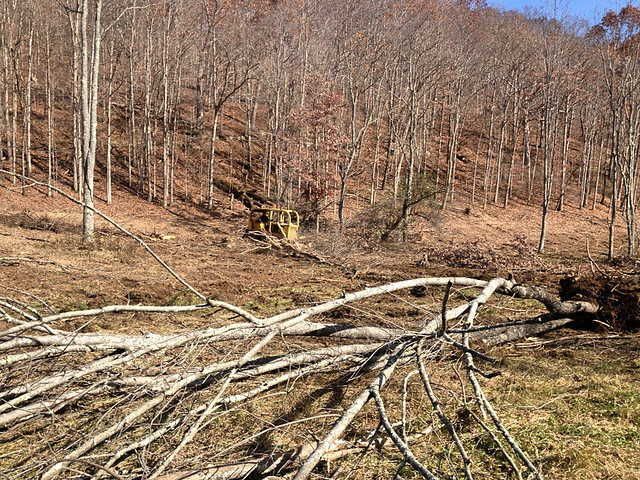 Then we start at the base and cut logs 16-20 inches in length, then we start at the base of each branch and do the same. We cut anything that is 3-4 inches in diameter into firewood. When all the trees have been cut in this fashion we haul the logs to one location with the bucket on the tractor and dump them in a huge pile, this is our working pile. Now it’s time to split the firewood. From the working pile we split the large logs into manageable size, I like to split everything that is 5 inches in diameter and larger. Some logs that are larger I’ll save for use in the open fireplace, but for the most part I like using smaller logs in the wood burner. Once a log is split, and anything from the working pile smaller than 5 inches in diameter, it is stacked in rows 4 feet high two rows deep onto pallets or runners to keep the wood off of the ground. The rows are then covered with tarps or metal sheeting to keep the rain and snow off the stack. The cover should not extend far down the sides of your stack, you want the air to be able to circulate around the logs to dry them out. 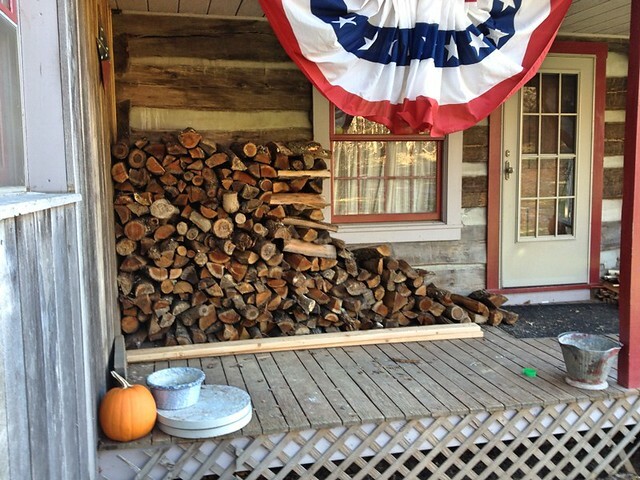 A fresh cut stack of firewood should be allowed to dry, or season, for about a year. 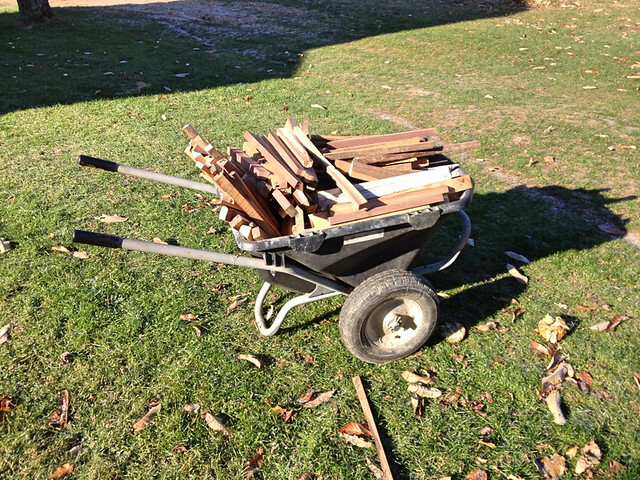 At the beginning of each winter my son, Sawyer, hauls wood from the seasoned stacks near the house and loads the porch and two indoor bins with firewood. As the inside bins are burned, he refills them from the porch and refills the porch from the seasoned stack near the house. 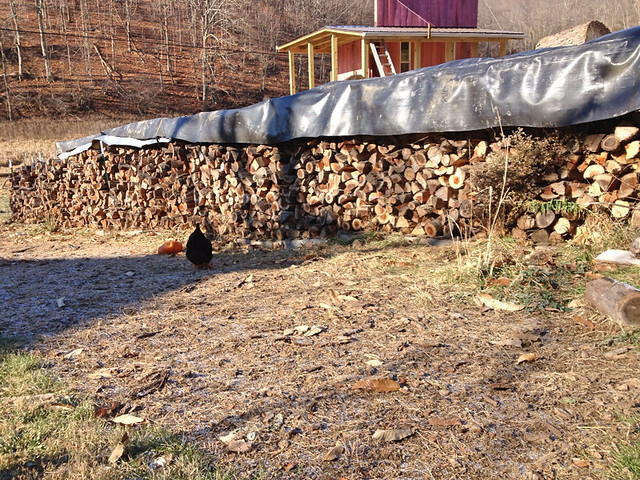 Next spring we will replenish the seasoned stack near the house from seasoned stacks around the farm. The first batch of firewood we processed this year was mostly cheery and I split most of it by hand with a splitting maul and a double bit ax. It was then loaded into the bed of a pick-up truck, hauled, and unloaded (not stacked) into a working pile near the house. Some of the logs were split again and there were a few oak trees that I used a hydraulic log splitter on. All the logs were then stacked as described above. 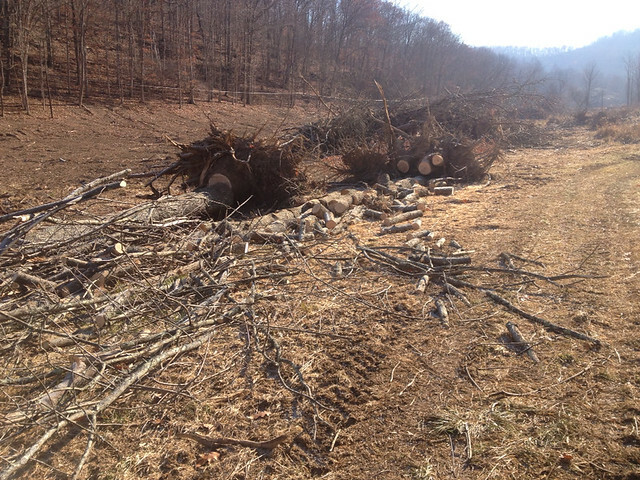 In the pictures above, you see we bulldozed trees over, collecting firewood was a by product of the larger pasture reclamation project. 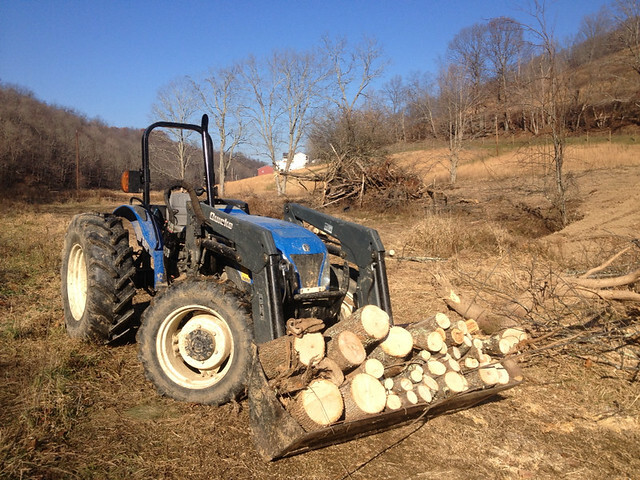 Typically we are in the woods felling trees with a chainsaw, limbing & cutting into logs, hauling the firewood with the tractor to a working pile nearby, then splitting & stacking the firewood so it can season. This whole process could be done with a couple of different axes, a hand saw, and a splitting maul. It just depends on how much sweat equity you are willing to invest. 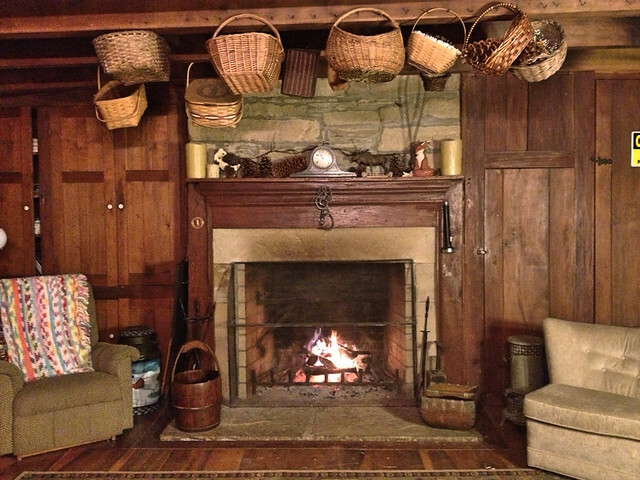 However the job gets done, its worth every ounce of effort, for the comfort of sitting next to the fireplace or wood stove, sipping a hot cup of cocoa on a cold winter night. Some links are affiliate links. At no additional cost to you, I may get a small commission if you make a purchase from these links. Thanks for your support in this way.